A door is a door, right? Think again. With recent advances in technology and design there are literally thousands of combinations and possibilities from which to choose. However they all originate with three basic types of exterior door systems using different combinations of the exterior door, glazing options, side lites and transoms. Exterior doors are stile and rail doors or door slabs with no glazing units in them. They can be used in either a single or a double exterior door configuration. 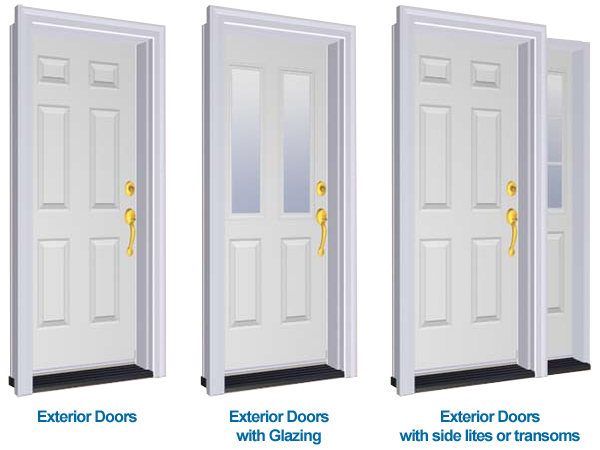 Exterior doors with Glazing are exterior doors with a glazed unit inset into the body of the door itself. The glazing unit can range in size from a small fan top unit at the top to a full length lite. Glazed units can be clear glass, etched, stained and with or without grills. They can also be used to create either a single or a double exterior door entrance. Exterior door systems with side lites and/or transoms are exterior door systems that add side lites and/or transoms to create an impressive appearance. The exterior doors themselves in these systems can be either solid or with glazed units. In addition to being impressive design elements, side lites and transoms allow natural light in to illuminate the entry hall and operable side lites also provide for ventilation. Next: Wood, steel, fibreglass or vinyl?